One must be able to trust medical products completely. That is why the manufacture of these products is subject to exceedingly strict requirements and regulations. By acquiring the ISO 13485 certification and building an advanced cleanroom, Rompa has joined the ranks of the select group of organisations that have what it takes to manufacture medical products. The manufacture of medical products is an interesting and rapidly growing market. 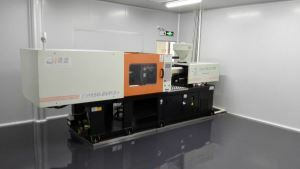 Rompa therefore invested in a brand-new cleanroom for its plant in Jiangmen (Guangdong). This clean workspace with a surface area of 55m2 is home to a 150-ton injection moulding machine. This lets us manufacture all kinds of (para)medical products and devices like pregnancy tests, thermometers, insulin pumps and blood pressure monitors. We also acquired the ISO 13485 certification, which indicates our compliance with the international quality and safety standards for the manufacture of medical products. The 150-ton injection moulding machine inside the cleanroom. “Although it is always important to produce in a dust-free environment, it is absolutely crucial to do so when manufacturing medical products,” says Machiel van Reenen, Quality Engineer at Rompa Shunxing. “The products must be safe for people’s health and the user must be able to rely on them completely. Think of e.g. the temperature measurements of a thermometer: it is absolutely vital that these are 100% accurate. Any dust particles released during the production process can affect the quality and functionality of the product.” That is why there are strict standards in place for the production of medical products. 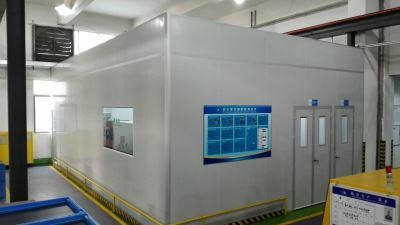 With the introduction of its new cleanroom, the production site in Jiangmen meets all of these requirements. The maximum dust particle count per m3 in the cleanroom is just 100,000. To compare: a 'normal' environment often has tens of millions of dust particles per m3. An employee cannot simply walk into the cleanroom. “There are quite a few safety measures in place.” Van Reenen: “Employees wear special clothing to prevent the dust on their own clothes from being brought into the cleanroom. The soles of their special footwear are cleaned before entry. This cleanroom suit (also known as a bunny suit) also prevents stray hairs from contaminating the area. Upon entry, an air shower blows the last remaining dust particles off the employee’s body.” The dust particle count in the cleanroom is carefully tracked using advanced equipment. Special paint ensures the floor is easy to clean. “We carefully select the employees who are to work inside the cleanroom. They receive excellent internal training to ensure they know all safety procedures by heart and leave nothing to chance.” Rompa already has experience with production for the medical industry. In the past, the company manufactured e.g. pregnancy tests for Clearblue, thermometers and heart rate monitors for Braun and various devices and blister packaging for Philips Medical in the Netherlands.